Lightweight, good fitting and comfortable! 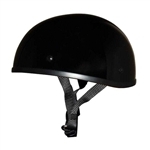 Check out our selection of lightweight low-profile DOT approved helmets below. Stop wearing uncomfortable big bulky helmets. You will love the new Badass Brand SMALLEST DOT helmets now available. Lightweight, comfortable, low profile and DOT certified. No more mushroom head. Be sure to check out the reverse rocker style which is designed to be worn back-wards, or the real Swarovski diamond ladies Badass helmet. Leather Bound in New Jersey has the Worlds Smallest, lightest DOT helmets in beanie & polo styles.